Does a software company need venture capital (VC) backing to be successful? We see $1.16 billion of VC money invested into data protection and cloud data management vendors in the past ten months, and no doubt more is on the way! And then there’s HubStor with $0.00 in VC. What is HubStor doing? Why aren’t we taking on boatloads of VC like the others? Is there something wrong with us? We’re going to have a fun discussion about why Greg Campbell and I—HubStor’s co-founders—have opted to build a successful storage software company without VC funding. Before I go on, I’d like to say I have no bone to pick with anyone in the VC community. I wish only for an open conversation about the industry and entrepreneurship. And I’ll share some of the philosophy behind HubStor’s approach. Why do startups take VC money? Starting a technology business is a particularly hard thing for two reasons: First, it takes substantial time to develop working software, especially for the enterprise. The next reason is that marketing a solution to enterprise technology buyers is expensive. Additionally, businesses aren’t often profitable until their fourth or fifth year—a harsh reality that’s particularly true for software-as-a-service (SaaS) companies because of what’s known as the “SaaS cash flow trough.” Due to the subscription-based revenue stream, SaaS startups receive payments from customers over a drawn-out period. Meanwhile, the SaaS startup makes upfront investments in development, sales, and marketing. The simple fact is your average entrepreneur doesn’t have the means to fund the initial development or go-to-market stages, let alone seeing the business to profitability. So, they partner with angel investors and perhaps VCs in their early stages, typically leading to multiple rounds of VC financing. While there are multiple VC deal structures, most involve the VC firm taking an equity position in the startup. The VC’s equity position is structured as a class of preferred shares that liquidate with preference (paid ahead of common shares) and typically have a guaranteed multiple on their investment. In exchange for issuing equity to the VC, the startup receives capital from the VC. This arrangement is all based on a negotiated valuation of the startup’s business. The control levers VCs have over the startup. VC firms exist to service a fund and the VCs are typically good financial managers with (hopefully) a good understanding of the market in which they are investing. But it’s important to note that VCs aren’t investing their own money. They operate a fund. A fund is a legal entity that typically has a 10-year term with options to extend. The Limited Partners (LPs) are the investors in the fund—wealthy individuals, government and corporate pensions, universities, banks, large corporations, and even charities. The VC firm is the management company that operates the fund. While VCs can move to extend the term of a fund, requiring LPs to vote in favor to do so, these funds are typically closed out at the 10-year mark, as initially defined. What does this mean for a startup? Well, if you participated late in the fund’s lifecycle, it won’t be long before your VC applies pressure to exit (i.e., sell the business). And if a business has piles of VC invested, you know the clock is ticking. As time goes, external pressure increases to make an initial public offering (IPO) or get acquired. As further rounds of venture capital are injected into the startup, more VC investor representatives tend to join the board of directors. Board control is hugely important because the board is the company’s bottom line on matters of strategy and key decision making. VC backing offers startups access to much-needed cash influx they can use to fast-track growth of the business. This is the most obvious upside to taking in venture capital. The startup can lease office space, grow the team, and make accelerated headway in sales and marketing efforts. The startup’s money troubles are over with VC, right? And VC backing is proof that the startup is a great company with a great product, on to a bright future, correct? In some cases, it works out. But unfortunately, not always. DataGravity is an example of the success illusion. Founded in 2012, they took on $92M in VC money, shipped their first product in late 2014, and ceased operations in June of 2017. This is a huge rise with a huge fall not long after. 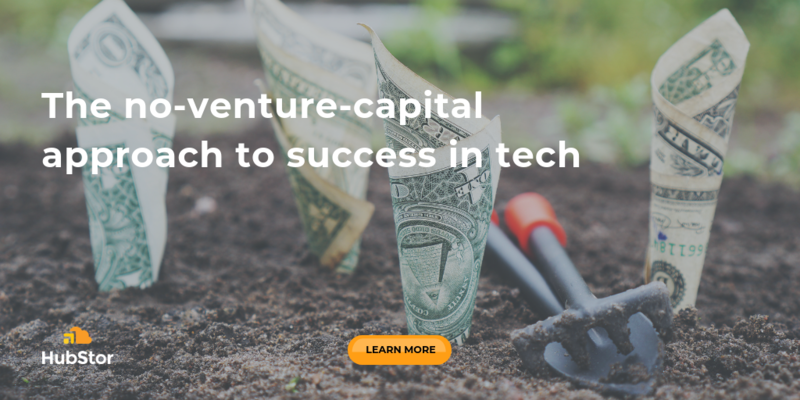 VC money gives the appearance of immediate success, but it can also obscure core business problems and even defer solving the problems. VCs do their best at due diligence before signing on, but they’re not always right, and they’re not in the trenches with the customer. The reality is that software companies (large and small) can spend years and not achieve a solid working product. Their business model may also be weak and not scalable. And customers may not be in love with the experience. Companies usually need to iterate their product(s) many times to achieve competitive status in the marketplace, let alone market leading, and early-stage VC money can cause distraction from this iterative process. How? The infusion of VC places immediate pressure on the company to perform. Sales growth targets become do or die for the CEO. Instead of focusing on customers, the team, the market, and the technology, so much of the CEO’s mindshare goes to maintaining a healthy posture with the VCs. The CEO no longer has time; they become too busy executing the latest direction from the board of directors. Much is done in haste because of the immense pressure to increase the valuation of the company along an arbitrary timeline. The company’s burn rate ends up far ahead of revenues. On the outside, it looks like a company going places. However, a very different reality can be playing out internally. Once a company is VC-backed, the valuation game begins. The startup’s valuation becomes all important because the VC money was invested at a particular valuation and it must continually increase for the VC to have a happy economic situation. Thus, VC-backed companies pay special attention to swelling the news of key hires, partnerships, opening offices, new product releases, and achievement of milestones to help posture for a higher and higher valuation. If the company fails to increase its valuation before going back for another round of funding, it has the dreadful prospect of what’s called a “down round” which has a significantly more dilutive effect on the existing shareholders. “We plan to hire 400 employees at our such and such offices” -- Why not announce after you’ve done it? Will you tell us if you don’t deliver? “We now have support for a great new capability” -- But the fine print in the press release says it’ll be available in six months, so why are you announcing now? “We’ve added Office 365 backup” -- But it only supports mailboxes. What about SharePoint, Teams, and OneDrive for Business? “Search is a core feature in the platform” -- But why am I restricted to searching filenames only? The valuation game is so important to VC-backed companies that their marketing will get out in front of their reality— and that’s a dangerous way to operate. VC-backed companies have a clock hanging over them and it ticks louder as time passes. At some point, regardless of all else, there will be immense pressure from their board of directors (which mostly consists of VC investor representatives) to IPO or get acquired. Liquidity will become the sole focus at some point because it’s time to close the fund and provide investors a return. This fact is ugly because few acquisitions have great results. What I’ve witnessed is most tech company acquisitions create uncertainty and turmoil for customers. And, since most VC-backed startups don’t IPO, if they’re not acquired strategically within the lifecycle of the fund, they’ll ultimately sell in haste. 4) The buck stops where? Ever wonder why the founder of a startup is now off to the side with a funny title like VP of Strategy and there’s a new CEO? Once the founders report to the board of directors (still dominated by the VCs in a VC-backed startup), they’re now just employees. If targets are missed, and the founders disagree with some strategic twists and turns, you can bet the VCs will be installing a CEO they think is better. The CEO could be a great person and an asset but the buck doesn’t stop with him. The board of directors has ultimate responsibility, right? But hold on, what exactly are the fiduciary responsibilities of the VCs? They do indeed have fiduciary duties to the board of each portfolio company they sit on, but they also have fiduciary obligations to their management company, to the general partner of the fund, and the LPs (investors) in the fund at the same time. These duties can absolutely conflict. And difficult times or key decisions for a company can impact a VC’s behavior or judgment in many ways because of their overlapping (and sometimes conflicting) fiduciary duties. So, there you have it: The people ultimately in charge of the company have potentially conflicting fiduciary responsibilities, and most of their fiduciary leanings go to external entities. And keep in mind VCs are investing for a sole purpose: To generate a return on their investment with as healthy a multiple as possible. The startup is simply a vehicle to achieve this end. Our definition of success is offering quality software that customers love to use to realize intended outcomes. If you can achieve that, deliver it at scale, and place a scalable business model around it, then financial prosperity is almost certain to follow. And that’s exactly what we’re experiencing. When a startup exists purely on merit, it must have a working product, happy customers, and a scalable business model to grow the business. There’s no illusion of success in this approach because nothing is subsidizing our growth – customer adoption is our growth fuel. Greg and I like to keep things simple because a simple design is easy to maintain and scale. In our view, that’s true in enterprise software as well as in business. HubStor operates without external pressures to move along some arbitrary timeline to advance a perceived valuation. And there aren’t conflicts of interest in our fiduciary duties. What motivates us? Our passion for doing that which is innovative, that solves real problems for our customers, and breaks the status quo that currently exists with storage, cloud gateway, archive, and backup vendors. HubStor is not a lifestyle business for Greg and me. VC money is a commodity and HubStor could easily be a VC-backed startup, but we’re at a point now where we don’t need it. Our growing team is on a mission to redefine data management for the cloud era, and the business is scaling organically. At this stage, the certain costs and risks of venture capital far outweigh the potential benefit.